While that was probably a bit of a overreach, to an extent she was right. And, as this blog shows, I am now one of those people. We are thriving! I don’t have the time to write daily because quite simply, we are living! David is rocking it! He is growing and moving and interacting and experiencing life. Hirschsprung’s is a distant memory (although one that will probably rear its ugly head again once “real food” comes into play). Down syndrome is a blip on the radar. 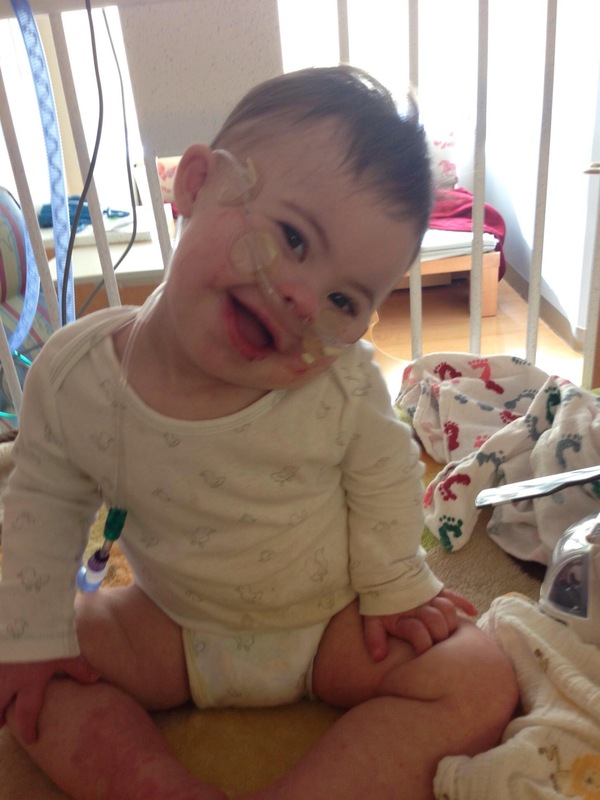 Duodenal atresia is easily forgotten. David is sweet and smiley and loving and happy. He loves to dance, to make funny faces, to read books and scoot all over our house. He understands more and becomes more cognitively aware every single week. He is completely smitten with his big sister and working hard at being a good big brother (some days he works extra hard). He’s the rockstar we always knew he was. He is truly a typical member of our family. We grow, we live, we love, we interact. It’s no different and just the same as all of your families. We’ll still have hurdles, we’ll still have sorrows and shed many tears. But today, it’s easy. Today it’s uneventful. Today it’s boring. And we couldn’t be happier. 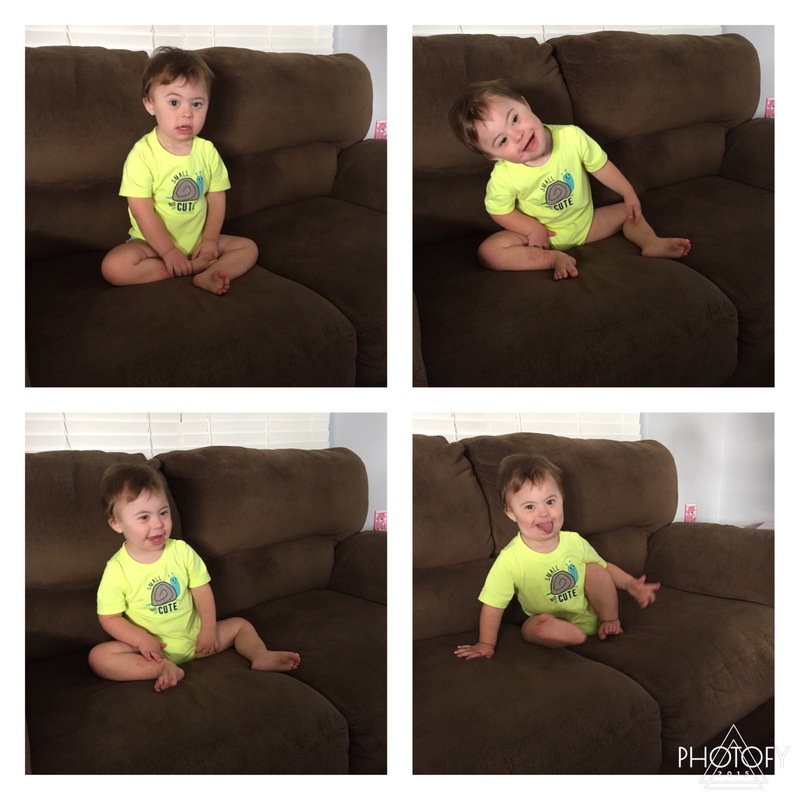 Every once in awhile, I’ll look across the room and David will be sitting or playing on the loveseat in our living room. It is such a beautiful juxtaposition for me. That is the loveseat Jason & I sat on the day we received our prenatal diagnosis of Down syndrome for David. We told Jason’s mom the news on that seat. Jason sat in silence with tears running down his cheeks on that seat. We sat underneath a cloud of sorrow on that seat. We were confused and scared and overwhelmed on that seat. I don’t think I’ll ever be able to think about that day without thinking about the loveseat and the shock and grief we experienced there. I won’t waste time on this beautiful day apologizing & making excuses for my lack of writing. Instead, know that I vow to be better. Is there a better day than Mother’s Day to reflect on those that ‘made’ you? Without my children, I wouldn’t be a mother. Each birth experience has reminded me of the miracle & responsibility of being someone’s mother and since I’m still fresh off a birth experience & deep in the haze of my post-partum hormones, I’ll use the excuse to get all sentimental about the three beings that created this new identity for me. Today, I am grateful for the ups and downs of raising human beings. I am tucked into a hotel bed in a room near a river (creek?) in Valentine, Nebraska. I’m supposed to be celebrating this day with my own mother 150+ miles from here but Midwestern weather has a mind of her own so instead, I’m full of local pizza & cheap wine while I write and listen to the sound of four snoring, sniffling, squeaking & breathing Oulmans around me. We have spent over 15 hours in the car over the past 3 days and there have been many, many tears in the process (including mine). Our weekend reads like a Greek tragedy where the only manageable solution is to laugh manically through the tears. It’s tough being mama to three (or 1, 2 or 4+). It’s even tougher when they’re sick or snarky or spitting up – you know, being children. It’s exhausting & beautiful and the greatest gift I’ve been given. I am accutely aware that not everyone receives this gift. Not all mothers have children. So what a blessing to be tucked in with legs draped over mine & toys and clothes strewn about our room. What a blessing to be exhausted from changing a million diapers and answering a million questions. What a blessing to be hugged and kissed and ignored and screamed for all within an hour. What a blessing to be a mother. Yesterday, I had my first break down since David was admitted. I called up to his room to chat with his nurse and ended up sobbing and sobbing. Like any parent, I want answers, and more importantly I want results. At this point it seems like they are doing everything they can and yet he’s still on just as much oxygen, with just as much pressure. At this rate, we could be in the hospital for a month! I mean, who hasn’t been battling a cough and phlegm for weeks now? I have! And I’m relatively healthy and have strong lungs. Poor David already starts at a disadvantage and has small, compact lungs. While he’s not regressing, he’s certainly not progressing and that leaves Jason and I feeling helpless. David is happy, he’s engaging. He’s having dance parties with his visitors and he misses us. This whole stay may be “easier” to take if he at least appeared sick. If he had a fever and was lethargic and fussy, we may think, “Ok, he’s really sick. He needs to be admitted.” But he’s his happy, giddy self. He’s flirting and smiling and winning hearts each day. We miss him! We want him home. I will not speak for the rest of my dear Down syndrome community. The following is simply my own personal views and experience. This is the part of Down syndrome that is hard. David is not hard. David is a delight. And there are many kiddos with Down syndrome who don’t have the health issues that David and others have. For them, the difficulty is with IEP’s and inclusion and milestones. And I am sure that is hard. I’m sure that’s exhausting and frustrating. But today, I would take six more hours on the phone fighting with Medicaid (which, sadly, is also part of my norm) over another day in the hospital. Down syndrome is nothing like I thought it would be. It is more rewarding and more challenging than I expected. But it’s the health issues that provide the greatest challenge. It’s the idea that this could be forever. Not a lifetime hospital stay, but we could expect to be hospitalized at least once a year for life! That’s exhausting. Today, keep praying for us. Pray that David turns a major corner. Pray that all the suctioning and oxygen finally click and his body starts to heal. Pray that Jason, Ella & I can continue and be encouraged. 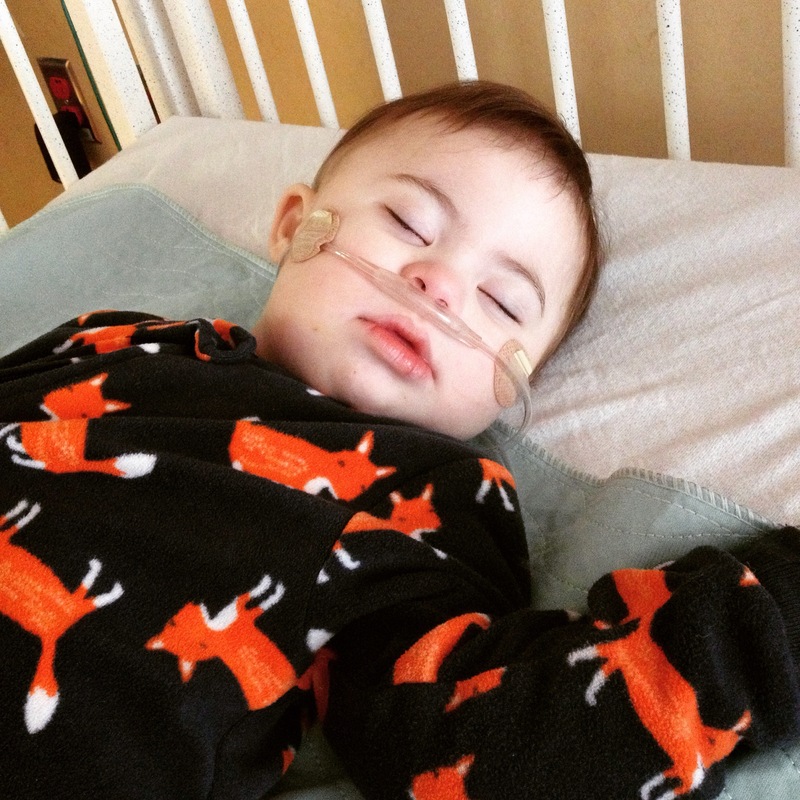 Pray for our rest, health and bodies (we’re all a little sick) and pray that this is David’s only hospital stay in 2015. We’re on day four of a new hospital stay. It’s been over 280 days since the last time we were admitted. Long enough to get comfortable & a little cocky. Hospital stays are for the really young & “sickly”. David is bigger, stronger, healthier. He can handle anything! Or so we thought. His scheduled Botox to “fix” his swallowing issues has turned into four full days of tubes, wires & questions. Why aren’t his oxygen levels higher? Is this really just a common cold? Did the Botox move? In the meantime, Jason & I are trying to navigate this all over again. The last time we were here, this was all “normal”. He had spent over half of his life in the hospital so we had a routine down and a flow. This time, we’re rattled. It’s unexpected and frustrating. Plus, he’s bigger and understands more so going about our daily business and trusting his care to nurses isn’t as realistic. He’s bored and interactive and misses us when we’re gone. We’ve been taking turns spending every night here but we have Ella to consider too. And, unlike last time, she has school and a routine to contend with as well. In the midst of all this, I realize how much I try and normalize our situation. I keep putting on a happy face and moving forward with previous plans. After all, this is “typical” for us. The world can’t stop because our little guy is in a time out. Yes, hospital stays have been an unfortunate normal in our lives over the past 18 months. I’m guessing we still have a few in our future as well. But it’s ok for me to be mad and upset about every single one. I can freak out every time my son is hooked up to tubes and out of my care for the night. I don’t want this normal and that’s ok too. So, we’ll hold out for the day when overnight stays really are a distant memory and marvel at how well we handled this unpredictable life. I know this blog is about David but today I’m taking a time out to talk about my other pride & joy. My first born, the daughter I dreamed of but never allowed myself to truly hope for, the girl who drives me to tears, fits of giggles, forces me to get alone time by locking myself in the bathroom but rush to school every afternoon to pick her up. She is the most intense, stubborn person I have ever met and takes after her dad so identically sometimes I don’t know what to do with either of them! Lately, I’ve been focused on the “difficult” parts of her personality. She is defiant, she is stubborn, she is moody, she is intense. On a good day, this makes her fun & full of life. On a bad day, I have no choice but to drop her at a friends and wander aimlessly around Trader Joes with a Starbucks in hand just to decompress. 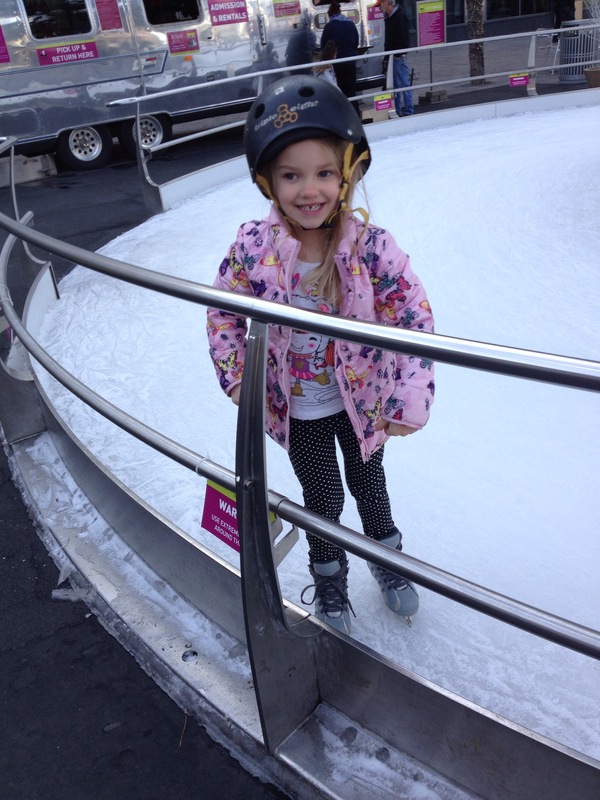 Ella had been asking to ice skate for awhile. There was a rink that was having a DJ, prizes & ice skating day so I decided to bring her and David while Jason was at a men’s conference at church. As soon as we got there, I got nervous because I realized I had to stay with David and so I couldn’t skate with her. She was excited to try even without me so we rented her her skates and helmet and put her on the ice. At first she clung to the railings while David and I walked alongside her. But after 10 minutes she started getting more comfortable and started letting go. She would try and skate a step or two at a time before she would cling to the railing again. After one loop around the ring, and her hanging onto the bars for most of it, I thought she would be “over it”. It was lunch time, I was hungry and so I told her just 10 more minutes. Ten minutes turned into hour and a half! She loved every second of it and I couldn’t get her off the ice. By the end she was skating 10 to 12 feet distances all by herself, not hanging on to anything! I was so damn proud, I literally couldn’t stop smiling. The entire day she kept turning to us smiling and saying “Mama, I’m doing it!” I don’t know if I’ll ever get her sweet little voice out of my ears and I pray I never do. She was full of such exuberance, such excitement, and such intense determination. By the end, she was trying to practice turning. She was amazing! There were times she cried, times she got frustrated, but every time I asked her if she wanted to stop or come back to the rail, she said no and kept right on trying. This weekend, I saw another side of her spirit. Determination. I don’t think I realized how determined she is because I always saw it as defiant. My heart was literally bursting with pride and I pray that from here on out, when she’s being difficult, I can remember that it’s maybe a little more about determination and cut her some slack. I’m so incredibly grateful I saw that side of her. More importantly I’m so incredibly grateful I noticed. What a blessing to her to have her mother see her not as difficult but as disciplined. I’ll take a disciplined child over a genius child any day (although I happen to think she’s both). I thank God for my “spirited” daughter and the humbling lesson in seeing the positives in people instead of the negative. Go Ella Grace! My first post of 2015! I had such a blissfully relaxing Christmas break & birthday but now I’m in that early January bummed out stage. No better cure than jumping in and getting back to normal. I never take my kids to doctors appointments. Honestly, I rarely even bring Jason with me! But, I had a checkup the day after Christmas & we’d already spent so many consecutive days together, it seemed natural the whole family would stay together. So we did! It felt like we had just sat down when I overheard a conversation between mother & daughter next to me. In fairness, they were talking before I sat down & I’m speculating about the specific details but here’s what I heard. The girl, who looked to be in her late 20’s seemed to be around 20 weeks pregnant & was sitting with what I assumed was her mother. They were going over a folder of information. It appeared that the folder contained some test results & the mother was explaining what the results meant. The mother was pretty animated & speaking a bit loudly so it was hard not to hear they were talking about Down syndrome. Of all the days for David to be with me! 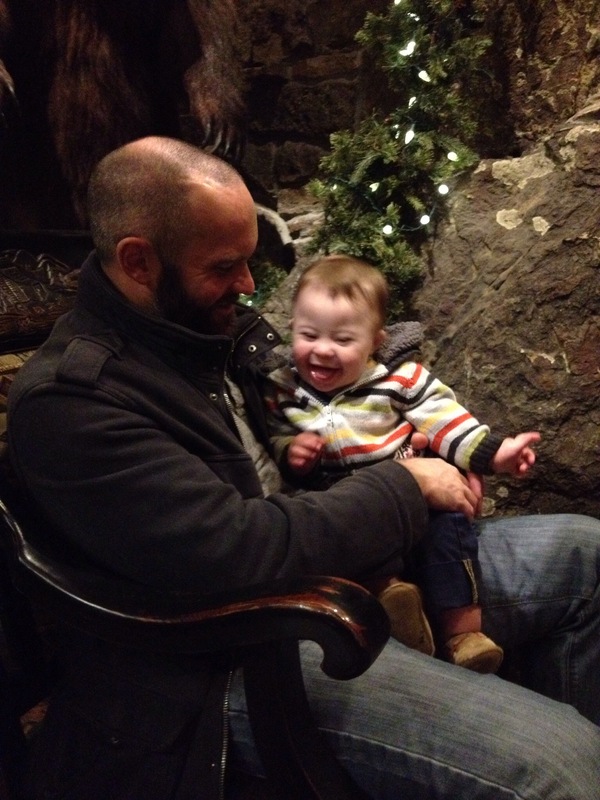 The snippets that I was picking up included, “Down syndrome, not for sure, amnio & results.” In fairness, none of those are negative words so I shouldn’t have been immediately on guard, but of course I was, especially with my precious son 10 feet from them. Jason & I kept exchanging looks and finally I said, “I’m going to say something to them.” I walked over and said, “Hi! I just wanted to let you know, we had a prenatal diagnosis in this office of Down syndrome with my son over there and I’m happy to talk with you about it if you have any questions.” The girl was very kind and said, “Thank you, this is all very overwhelming.” Her mother, was a little less kind. She immediately started preaching to me about the current research, how only an amnio is 100% but that it causes miscarriages and how blood work isn’t accurate. I was flustered because a) I wasn’t expecting that kind of reaction b) I’m not as educated as I want to be on prenatal genetic testing beyond my own experience and c) she wasn’t kindly asking me questions and trying to get first hand information. She was aggressive and her words had a negative tone. I felt like she was trying to educate me! I explained that we had received a positive diagnosis through my 12 week blood work – big mistake!! She was quick to remind me that there are no positive or negative results for the early genetic tests that are out there. She’s right; there are higher or lower probabilities. But, because these tests are under increasing fire and there’s been some new studies completely debunking their accuracy at all, it seemed she was using those as her touchstone. She kept telling me, “They’re only 40% accurate.” (Seriously, she said it 4 times) The only thing I could respond with was, “Well, it was 100% correct for us.” Again, the pregnant woman was kind & kept telling me how cute David was while her mother asked me if I’d had an amnio and additional follow up questions. I was kicking myself because I was trying to be calm and an advocate for my son and instead I was flustered and stumbling for words. I did have the presence of mind to tell both women that my OB’s office handled our diagnosis wonderfully. The mother almost tried to argue with me about that! She insinuated that the doctors were pressuring her daughter to get the amnio or terminate. I can’t speak for their experience or for every doctor in the practice, but ours was as positive an experience as we could’ve hoped for. I’m no stranger to the shock and grief that comes with a prenatal diagnosis. And I’m an advocate that everyone should feel and react however they need to. But this experience in the office left me uncomfortable. I felt so bad for the pregnant woman who was being, it appeared, negatively impacted by emotional information. The ironic part is my OB’s office has my business cards in their lobby since I work with clients and their reproductive mental health. My business cards were literally within grabbing distance! Why didn’t I offer to have her contact me? Why didn’t I refer her to the Rocky Mountain Down syndrome Association? Why didn’t I tell her about the Down syndrome Diagnosis Network? 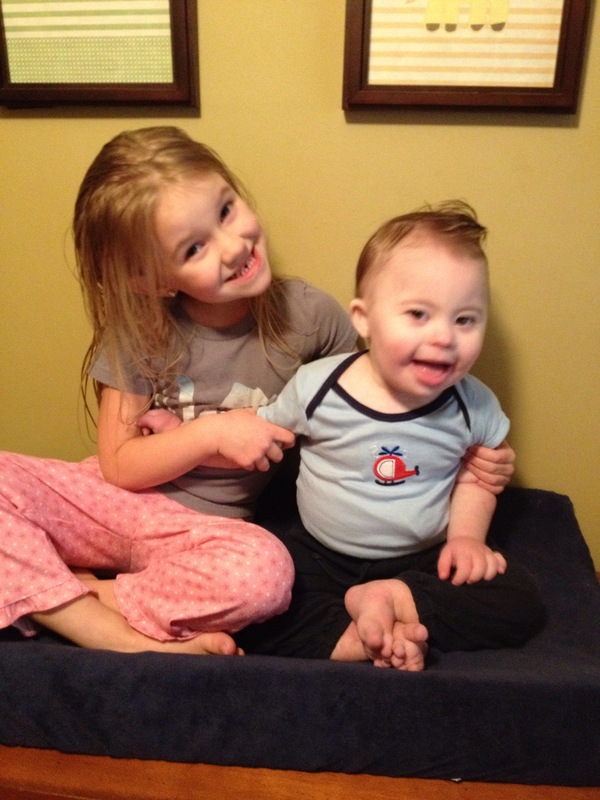 I want to be the calm, bold, knowledgeable mother that makes Down syndrome seems less scary. I want to be a quiet advocate for David. I want our experience to reassure people & not be reduced to stutters if I’m confronted. Here’s to hoping all three of us women leaned something in the office that day. There are a million things that can go through ones mind when you get a positive pregnancy test. For many people, it’s excitement. For some, it’s dread and denial. For a select population, it’s fear. Fear is honestly such a normal part of pregnancy but I’m going to speak specifically to the population of women that only experience fear. For any woman who has had a traumatic pregnancy event, fear is practically the only emotion experienced when seeing a positive pregnancy test. After a miscarriage or still birth or infertility diagnosis, the rose-colored glasses are off. Gone are the days of running excitedly out of the bathroom to show your partner the little stick. Excitedly calling parents & best friends are a memory if they ever existed at all. You are filled with a fearful hope and begin preparing yourself for the inevitable loss rather than get swept away in dreams of the future. There’s another group of us that fall into a similar category – Moms who are pregnant after a special needs diagnosis. We’ve seen the “other side”. We’ve gotten the call or sat in a somber room. We’ve met with professionals & heard the statistics. And regardless of how blessed we feel to have our “special” kiddos, there’s a fear that rests in the back of your heart. At every appointment and visit, we’re waiting for the other shoe to drop. We’re waiting for a similar yet completely different diagnosis. Cleft lip? Missing limbs? What surprise issue will this new little one have? It can be scary to even hope for “typical”. I was chatting with a fellow therapist recently about my current pregnancy. I was quick to dismiss my feelings of anxiety & fear but she stopped me. She reminded me that my pregnancy with David was traumatic and I don’t need to minimize it. I love my son & wouldn’t change him for the world but that doesn’t mean I didn’t experience heartbreak during my pregnancy with him. It definitely doesn’t mean that I’ve accepted anything that comes my way & by default this latest pregnancy has been blissful and calm. Quite the opposite! I look back on my youthful naivety when I was pregnancy with Ella and almost laugh. In comparison, this pregnancy has been quiet. That’s the best way to describe it. We’ve been reserved, haven’t made any major announcements or even told everyone we know. We kept it to ourselves & didn’t even tell our parents until the end of the first trimester and our blood work testing for all Trisomies had come back negative. It’s been a journey. It’s been emotional. It’s been a process. Every day we get a little closer to calm & blissful. We are more than delighted to be surprised blessed again & know we’re lucky. But I don’t want to minimize the journey. I don’t want to put on a brave face and be inauthentic. I think that’s detrimental to other moms. It’s ok to be scared. It’s ok to feel overwhelmed. Pregnancy doesn’t have to look like a TV commercial. It can be messy with lots of tears. There is no shame in taking each day for what it is and trying again the next day. This is our journey and we get to determine what it looks like, tears, fears & all. There are a lot of components to being a special needs mom. It’s a balancing act of treating your kid like “everybody else” and managing all the nuances, therapies and appointments that make them “special”. You don’t want to treat them differently and yet their situation calls for different. You don’t want to talk endlessly about one child but you feel like you have to enlighten everyone about your child’s specifics. With the rise of genetic research and developments has inevitably come genetic testing. Just this week news broke of a couple who utilized fertility treatments in order to select their babies gender. Families are finding out very early in the first trimester if their children have genetic abnormalities and are given the option to terminate practically simultaneously with the results. The age of designer babies is here so where does that leave David & his peers? I’ll tell you where it doesn’t leave me. In the judgement zone. People assume because we had a prenatal diagnosis and continued on with our pregnancy that I have strong feelings against termination. But I don’t. I have strong feelings toward education. I think the information that is out there is dated and scary. I think parents are terrified of the unknown. I think technology moves faster than human emotion. And more importantly, I think it’s not my place to judge. David is a lot. Strike that, David’s schedule is a lot. His needs are more extensive and the impact of his life has had an emotional affect on me. But truthfully, he is my easy child. He rarely cries, he calms easily and he’s perpetually joyful. When I hear parents say they couldn’t handle the difficulty of a special needs child, I don’t judge, I just know they haven’t been educated. Saying that is like saying it’s too difficult to schedule pediatrician check ups, pick proper food or buy diapers. All children have needs. A special needs child’s are just different. Not more, not less, just different. So I’m not defensive about my decision or anyone else’s for that matter. I just really stepped up my offense and decided to rock parenting. Not special needs parenting, just parenting. Turns out food, clothing, shelter and love work for “special” kiddos too. We are fresh off a month of thankfulness & counting our blessings and just beginning a month of hope and advent. I sit in awe that I have been entrusted with these little beings. I am overwhelmed at the responsibility and blessing that has been given to me. I know I wasn’t “chosen” for this role but man am I blessed to be inducted into the lucky few. And Em RanON . . .